I bundled up warm (many thanks to the room-mates who provided me with some useful items, including two balaclavas and a pair of over-mitts) and headed off into the cold. What was surprising is that with all this gear on I barely felt cold at all. There were a few points where my feet got pretty cold, but by keeping moving, wiggling my toes and staying in the sun as much as possible I generally felt pretty comfortable. Also surprising was the amount of time I ended up being gone for. I left around 7:45 and got back around 11:45 with no heat breaks. I was outside for about four hours, the longest run I’ve had this winter. It helps that I really enjoy my TMR route but it’s interesting how quickly time passed and how little the cold affected me. Anyways, I was able to spend so long outside because I had lots of things to poke through. I made a bunch of decent finds, even if nothing in particular stands out as spectacular. This spot was one of the two “garbage producers” that I wanted to check out. It’s where I found the bullets last week and the silver doohickey the week before, among other things. 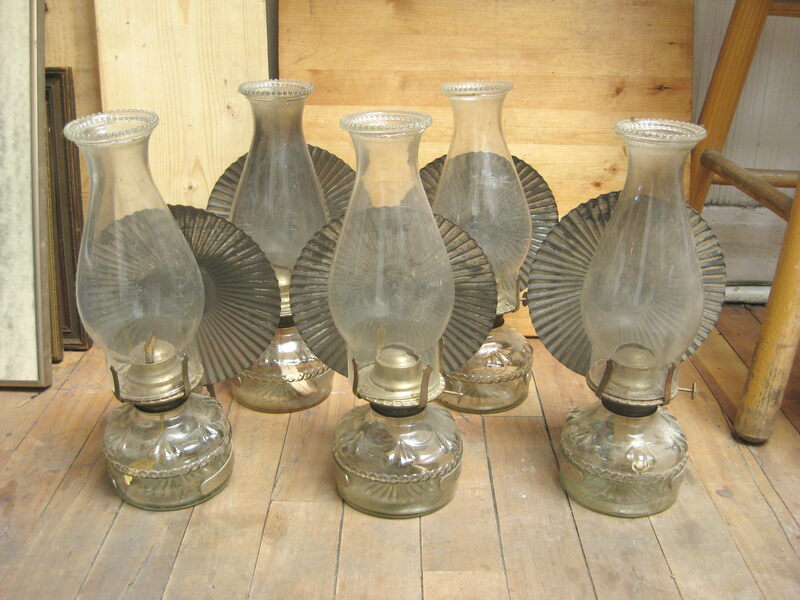 This week I was offered these vintage oil lamps made by Eagle in the USA. They come with light reflectors in the back. There doesn’t seem to be anything wrong with any of these, though they need a good wash and there’s a bit of surface rust to be scrubbed off some of the metal pieces. These have some value, similar ones sell for around 15-20$ on Ebay. The shipping costs though seem to average around 50$, a hefty sum probably due to how fragile the glass is. That shipping price makes me wonder if people are willing to pay closer to 60-70 bucks for a nice oil lamp. Garbage producer number two. Both of these last two places seem to be very slowly cleaning house. This is where I found the blood pressure device a couple weeks back. My feet got pretty cold from hanging out here in the shade for too long. 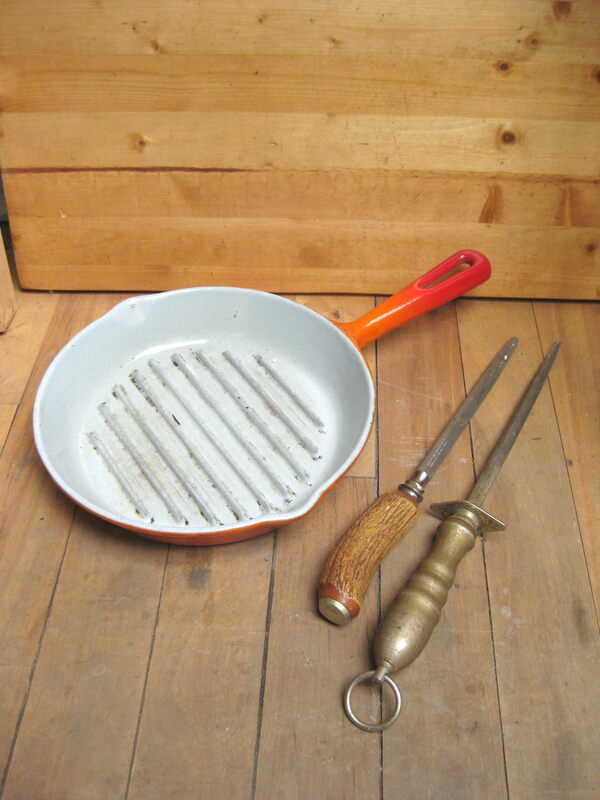 I scored a cast iron pan and two nice vintage knife sharpeners. I always love finding cast iron. The knife sharpeners seem pretty solid, one being made in Sweden and the other in Sheffield. 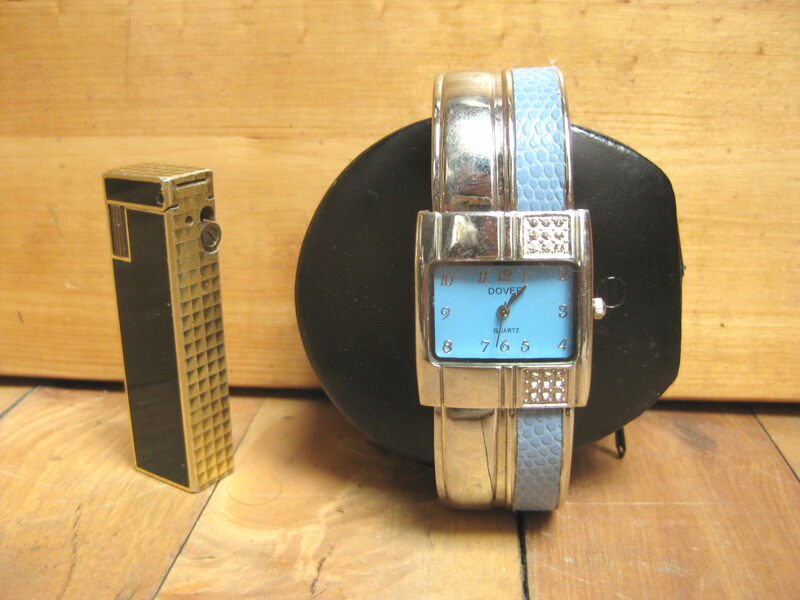 There was also a decent watch and vintage lighter, a Benlow by Colibri. Assuming they work these should sell for 5$ each at a yard sale. There was also this odd thing. At the bottom of each strand of fishes is a gun, a sword, and a took (the longest). On the sword is written “Amara.” It looks pirate-ish and could be some kind of charm. At the least it makes for an interesting decoration, and could potentially be part of a good Halloween costume. Later I went to a part of TMR that I usually don’t cover. Usually when I get to the little area west of Lucerne the trash is already picked up. Today, however, I noticed that the truck had not yet passed. I’m wondering if they changed the route around, there’s some other places where the truck seems to be coming earlier than usual. I made some good finds on Norway, a road which I’m pretty sure is the western boundary of TMR. 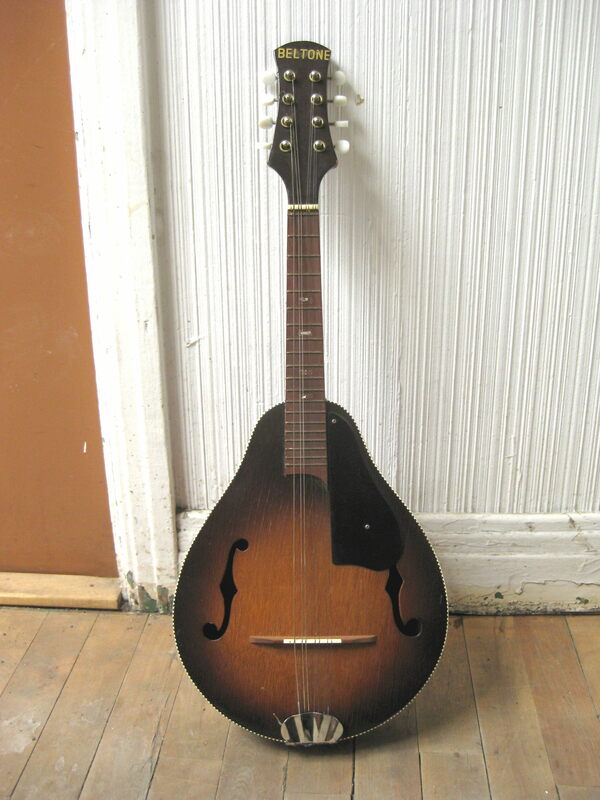 I noticed this mandolin in a case right away. When I picked it up a woman opened her front door and told me that it was broken and fairly cheap. Apparently it belonged to her husband and he’d had it since the 1960s. She was quite nice. The main problem is that the neck is being pulled off by the tightness of the strings. It may be something that just needs some glue or it could need to be bolted in place. Either way, I know a lot of musicians and I’m sure one of them would be willing to take it on as a project. It’s quite nice looking cosmetically, so even if it’s unfixable or not worth fixing it could be used as a decoration. 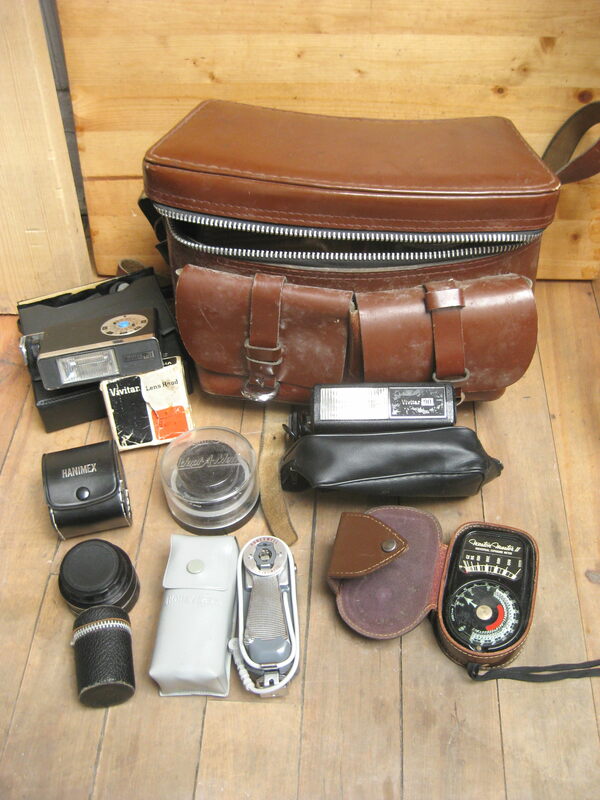 There was also a nice old camera bag filled with various vintage camera and developing equipment. There’s a few pieces here (and still more in the bag) that have some mild value but it’d be annoying to sell them all individually. Maybe I could make some decent money selling them as a lot. 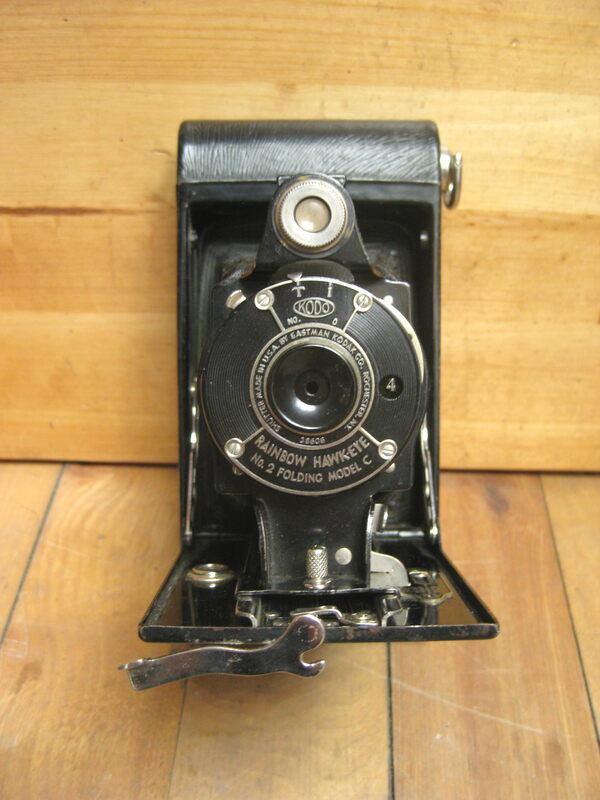 Another nice find was this Kodak Rainbow Hawkeye folding camera. One similar to it sold on Ebay for 45$, though it was slightly cleaner and came with a box. 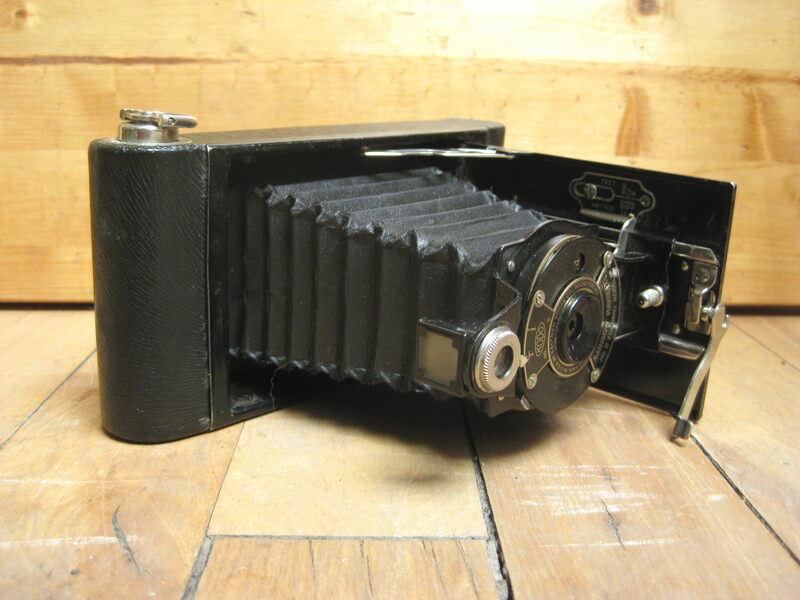 This one’s probably worth around 25-30$, assuming I’m right in thinking that there’s nothing really wrong with it. In another spot were a bunch of boxes full of junk out by the curb. 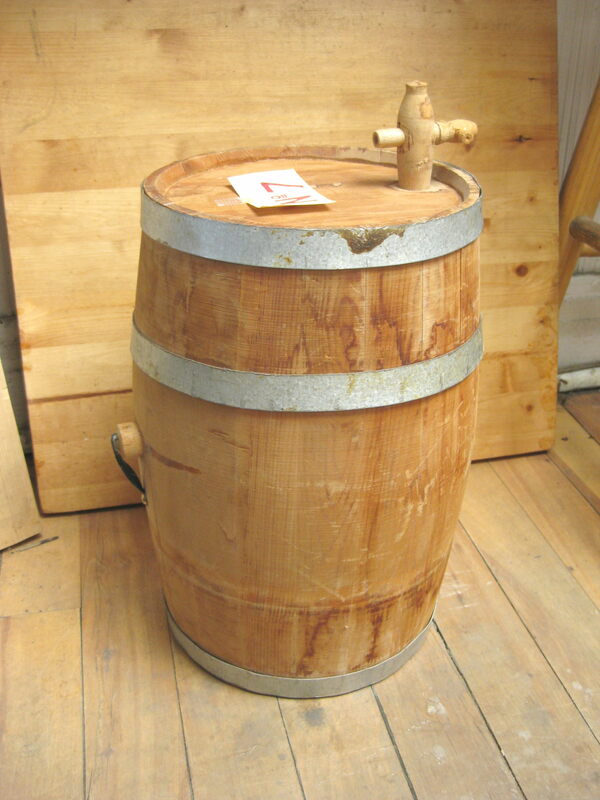 Most wasn’t particularly interesting but I did take this wooden keg. It’s around two feet tall. Does anyone know what this might have been used for? Is it just decorative or does it have a practical function? It seems pretty solid. At the top is a piece of paper with “No. 7” written on it. This pile held a bunch of stuff that looked to have belonged to a teenager. I’d bet that whoever it was moved away from home a few years ago and were asked to clean out their old room. There were a few cellphones and a couple watches. 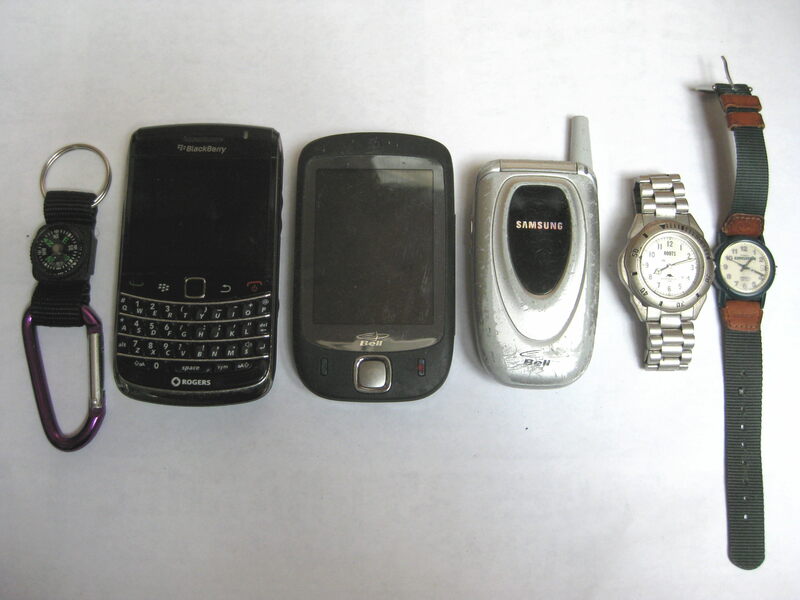 The best item from this bunch is the Blackberry Bold 9700. It has a broken screen but would still fetch around 10-20$ by itself on Ebay “for parts or repair.” I have enough cell phones now to make a nice lot but I think I’ll wait until the end of the month. I’ve been finding a lot of cell phones recently and I might find more as people move before the 1st. 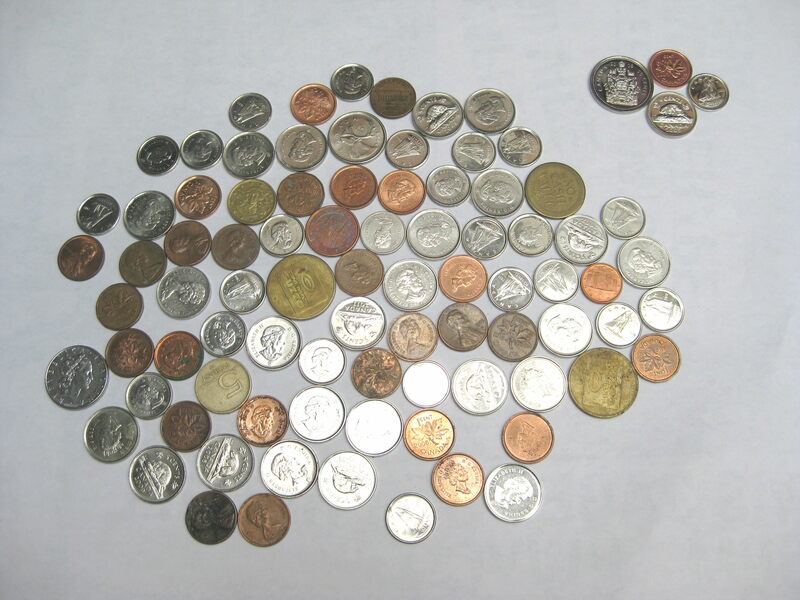 Again I find a bunch of change, including a 50c piece that was still in its original mint plastic. There were also a few foreign coins and a couple of arcade tokens. In total there’s around 4$. Easy money! Last but not least is this old iPod Mini, vintage 2004. I charged it with my docking station (also found in TMR) and it works fine. I was surprised to learn that there’s still a market for these, they sell for around 20$ on Ebay. They’re old but I guess they’re still pretty useful, though I’ve never owned one personally. I’ll probably sell this one at a yard sale. I’m pretty tired from all the biking (I also didn’t sleep well) and I’m going to take a nap. Tomorrow I head off to Rosemont in hopes of finding more neat stuff around where that silver envelope sealer was. I’ll keep you posted! You are a brave man for scavenging in this cold.I love the mandolin you found—looks very classy.It is also remarkable that you found another $4 in loose change in the trash.Also this money would be literally going in the landfill if it were not for you.I hope an environmental organization or cultural organization awards you with a grant to encourage you to continue to make such finds and to do more field research. it occurs to me, if any of it is prior to 1970 or such, it might be worth keeping. I think pre-1969 quarters and dimes have some silver. I keep my eye out for those (usually pretty easy, they have a specific look to them). 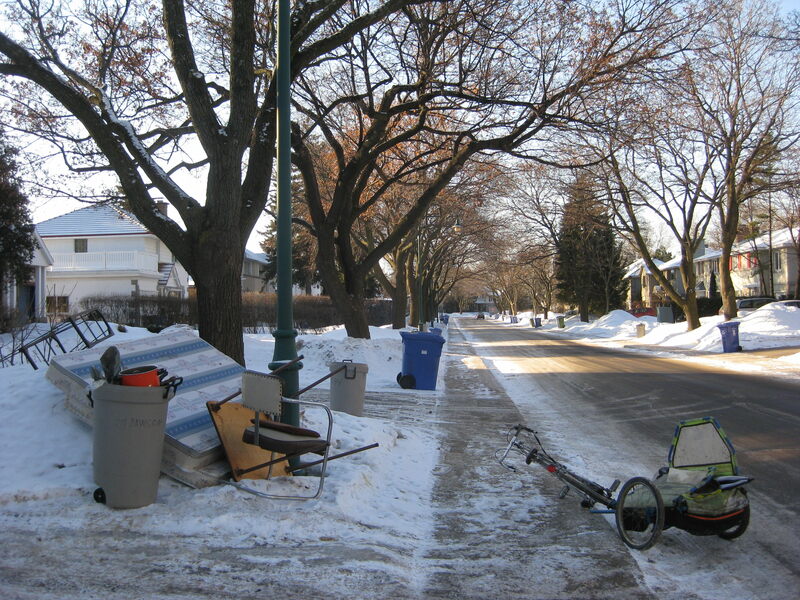 Why do people put out valuable stuff in the trash in such cold weather?There is a much smaller chance that scavengers or passers-by will rescue treasures from the garbage when it is so bitingly cold than when the temperatures are warmer. I doubt they’re thinking too much about others potentially rescuing their things out in TMR. There’s not many passers-by in general and if they do their often more wealthy people who don’t really need anything. I see more people leaving stuff out to find more often in middle class neighbourhoods like the Plateau, Rosemont and Villeray. It happens quite frequently with bottles. Still, most of the best stuff I find is in the black bags, which to me means that people aren’t really thinking that anyone might find it. It seems like you did alright on this trip. I hope it made braving the cold worthwhile! I haven’t found anything for a while, but today I finally found a use for the metal pitcher my husband brought home from the trash a month ago. I’d like to buy the 5 oil lamps. Yep, all 5 of them. I can come and pick them up over the weekend. I picked up something from you a long time ago… still close to Laurier station? Since I’d take them all 5, would you sell them to me for 15$/a piece? 75$ total? 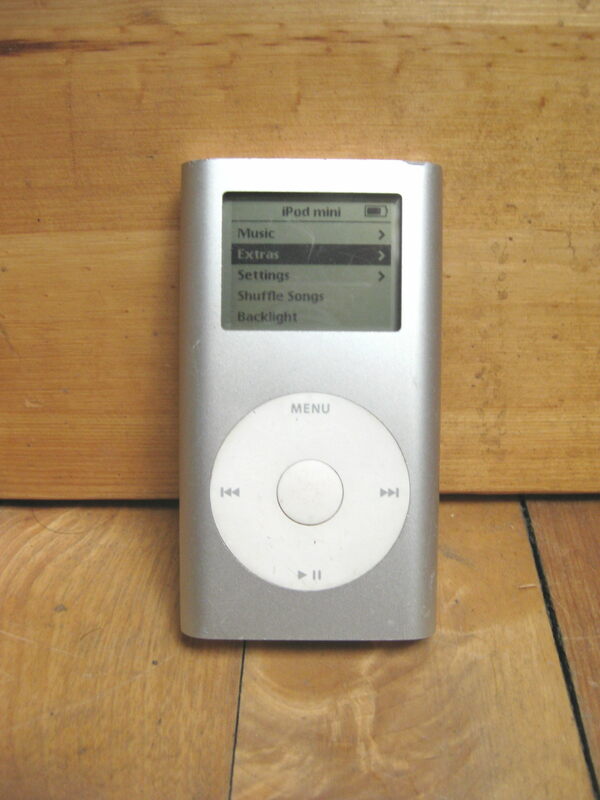 The iPod mini had about 6gigs of hard drive space, which is more than the 512K of my first Mp3 player. But, the hard drive could be replaced with a CompactFlash card, apparently up to 128gigs. That likely draws less power and certainly makes it mechanically less fragile. I’m not sure if it’s just a matter of unplugging the hard drive and plugging in the CompactFlash card, or requires an adapter, but I thought the pinout on those tiny drives were the same as the CompactFlash card. So you could get a quite loaded Mp3 player that way, the newer iPods have relatively little storage space, and the larger sizes cost more. One thing I read some years back is that Mp3 players were disappearing as a standalone device. Too many getting the function in something like their cellphone. Even one of the digital cameras I found in the garbage would play MP3s, and I have a couple of DVDplayers that will play MP3s if they are on a USB flash drive. And you don’t see anythign but cheap MP3 players in the flyers these days. So that might keep prices up, especially this one since you can expand the storage space relatively easy. I think you become demanding on your find. It’s beautiful this collection. I love the barrel. I live too far away to buy it. You do a good job. BRRR maybe you weren’t feeling the cold much, but I was feeling it for you when I read this post. 🙂 Watch those toes (they’re the only things my dad ever froze). There was a lot of variety in your finds this outing … and a super quick sale came of it! 🙂 You’re going to have a good load of stuff when it come time for your first yard sales in the spring. 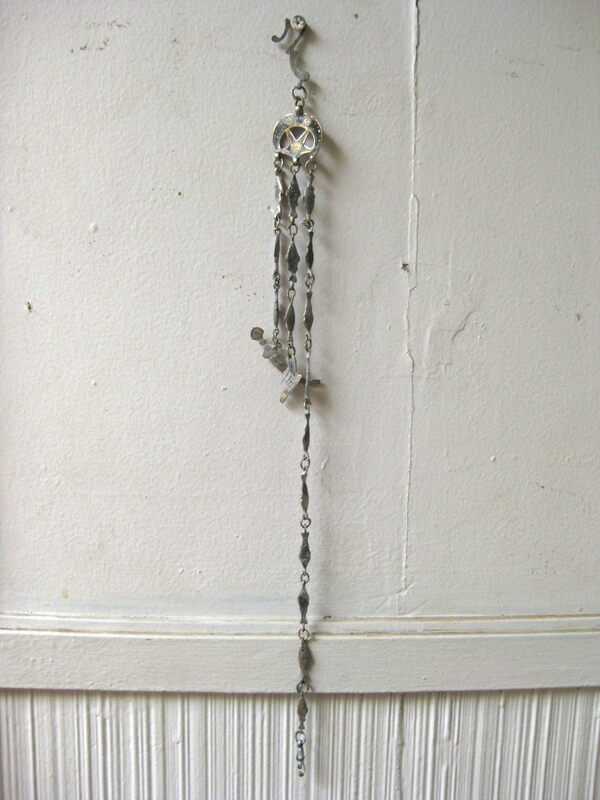 That fish chain thingie might be a good thing to post on http://www.reddit.com/r/whatisthisthing/ Is it made of silver? The “star” and crescent (moon?) could be Turkish, or something. Also the little sword is curved, like a scimitar. What happens when you freeze your toes? At best, as happened to him, your big toenails fall off (repeatedly over the years). At worst, you lose your toes. It is too cold to trash-search for most people.Why don’t people in Town of Mount Royal not start putting up ads on Craigslist and Kijiji in the FREE section to give away good stuff instead of throwing ity in the trash?Most of the times I see that people who puts ads in the FREE section are from downtown,The Plateau,Verdun,NDG,St.Henri,Villeray,etc.There are very few ads in the free section from TMR.One man,Martin,cannot possibly recover all the treasures from all the 20,000 people of TMR.,but you do a damn good job.I hope someone living in TMR will read my post. People throw things out because it’s convenient, or because they have no other options. Don’t make this a class war. I’ve said it before, you are moving and suddenly there’s no more room. There’s no time to deal with the stuff, so it gets tossed. Or, you have no car, so there’s no easy way to get rid of things. Someone dies, and the reality is, you don’t feel like dealing with it right then, but you need to clear out the place. If you try to sell something, and there’s nothing magic about things that are free except the price is zero, you have to wait for a buyer, you have to negotiate a time, and then at least some of the time, the person never comes to get it. I can’t see the point of placing ads for free items, since by the time you have dealt with the item, you might as well have sold it. Things don’t magically become more valuable because there’s no price on them. If someone doesn’t need a VCR, then advertising it for free won’t help. The reality is that for some items, there is a limited subset of people who are interested, so trying to find a proper place for the item will require more work. Even if someone has the time and means to drop things off at some charity, charity groups are putting limits on what they will accept. Three years ago on July 1st, I passed by Sun Youth and they had a sign up “We can’t accept mattresses or sofas, no tv sets, etc, and don’t leave things here”. They were closed that day, so anyone needing to get rid of things right then couldn’t. And they were selective in what they’d take. 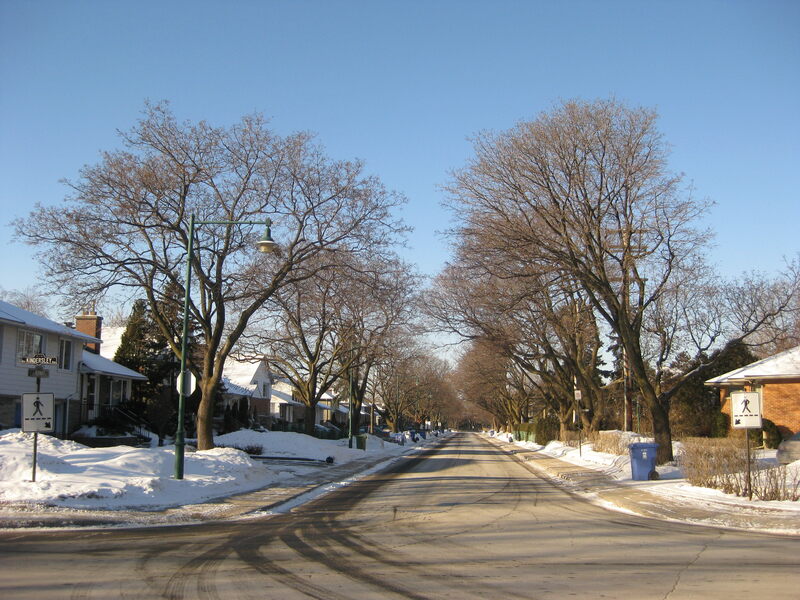 The Westmount Rotary Club “garage sale” returned two years ago, but a decade ago they stopped taking clothing, they no longer want electronics, they aren’t taking books. A lot of places can’t handle electronics, they have nobody who can test it or place a value on it, and if it doesn’t work (since charities are often a dumping ground for things that don’t work), they have to dispose of it someway, and for them it may cost them to get rid of things. Even when the stuff works, for it to sell requires someone coming by that actually wants it. That’s true of garage sales, too. You can’t sell that tape deck or VCR unless someone who wants it passes by, and if you have something exotic, the average person won’t be interested. And if nobody put stuff in the garbage, then there’d be no scavenger hunt to find it (an excuse to get out and look), and this wonderful source of things would no longer be there. I would argue not enough people are willing to check the garbage, to bring things home that are just lying on the sidewalk easy to see. That’s a lot more convenient than negotiating some time one can go all the way across town to pickup some free item. Why should the onus be on the people throwing things out, and not on people who think taking things from the garbage is beneath them? I have been amazed by what I’ve found in the garbage, but I’ve never said “there should be a law” or “these lazy people shouldn’t be throwing things out”. I just take the things I want, and dream of whatever else I might find. To me it’s either ignorance of the value of things, ignorance of good methods of redistribution, and plain old laziness or indifference. It’s definitely a bit easier to give away for free as it is to sell. Generally you will have contact with some people within an hour or so who are interested. While there are always no-shows it’s generally not too hard to find something, though co-ordinating times is always a hassle. The best method for getting rid of a lot of stuff at once is just to put up a “Curb Alert” on Craigslist. It takes much more time if you put up individual things. People are victims of their own poor planning a lot of the time and I understand the role time constraints play, especially when it comes to moving. When I last moved I put a lot of stuff on the curb but put out a “curb alert” and much of it was gone by the time the truck came. I considered that a success. Still, not everyone knows what I know. In the end though, I have to say that I do this there is a difference between how upper-class and middle/lower-class people value their things. I don’t think we should generalize but I would generally say that wealthy people tend to be a bit more indifferent about wasting good things, while middle and lower class people tend to fall more into the “ignorance of value” category. 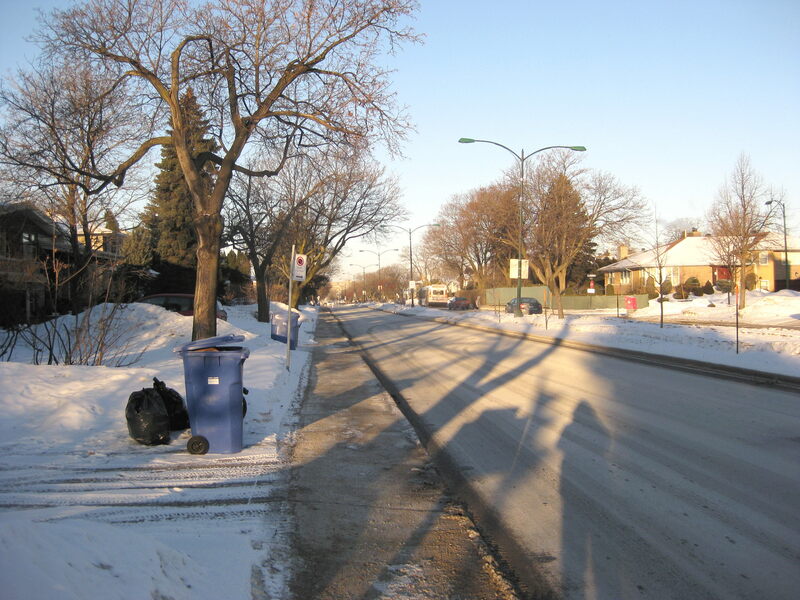 MIchael Black is right that passers-by should be observant about trash and rescue good stuff before the arrival of the garbage truck.But in minus 20 degree temperatures people are just in a rush to go home or reach work.Scavenging for pleasure is more common in the autumn,summer and spring because opening garbage bags,boxes and recycling bins in warmer temperatures is so much easier.Many people are afraid of frostbite on very cold days like today.In this siberian cold,even many bottle collectors and can collectors stay home.It is just very hard to open a black garbage bag and save 20 dollars in change when your fingers are numb from the cold. I grew up in multiethnic Cote Des Neiges and went to high school there.I graduated from high school 12 years ago and after finishing CEGEP moved to Ville St.Laurent.I doubt many residents in Town of Mount Royal bother to superficially scan the garbage on trash pick up day in their neighborhood even in summer.There might be several exceptions,but the people there are mostly rich and in several cases snobby.I used to play sports for teams in my schools against kids from TMR.Many kids in TMR used to poke fun of us,called us poor trash and some used racist epithets against Filipinos,blacks and Pakis asking them to go home.TMR is mostly white,and has a reputation of being an uppity neighborhood.You are doing great salvaging treasures there because many of TMR’s residents would not care about salvaging any treasures from curbside trash. 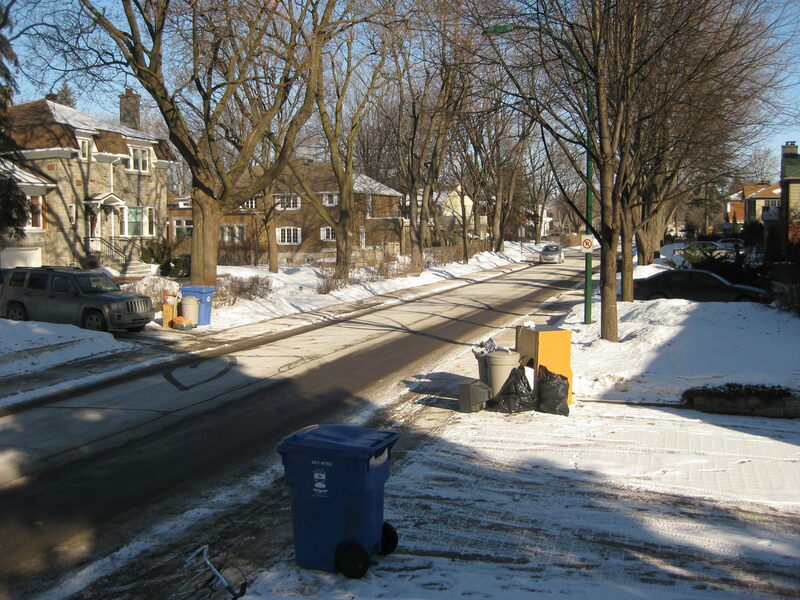 It is fascinating about reading your weekly excursions to TMR.TMR is a very ritzy neighborhood.Do you find and rescue good,unspoiled food in the trash of Ville of Mont Royal often?Please keep an eye out for this and report on this.I am all for reducing waste,especially food waste. Your blog has really evolved and grown better with time.As time passes,you could maybe develop an interest in other useful items found in trash.For example,you could look more in the trash of schools,universities,libraries,factories more often to see if you can find cool stuff or useful stuff.It may be too cold next week to change your itinerary much so you should stick to your routine for the upcoming week.However,you could try to incorporate Westmount into your weekly trash excursion like you have done with TMR.I am interested in how wealthier Westmount stacks up against TMR in trash treasures.Once the weather warms up a bit,please start going to Westmount once a week as much as possible.The rest of your itinerary doesn’t seem to have changed much since you were living in the Plateau,except that now you go to TMR weekly(compared to never before).In TMR you often find the best stuff of the whole week.See how small changes sometimes yield great results.I sure appreciated your occasional outings to Ahuntsic,Ville St.Laurent and Cote Des Neiges too last year.Good luck in riding out the cold wave and don’t get frostbite. Do you make it a habit to check out the trash cans and recycling bins of your own apartment building ?You might find treasures there. Your number 7 barrel looks very similar in size and shape to cocktail ageing barrels I’ve seen in magazine articles. Certainly looks practical enough, rather than just decorative.